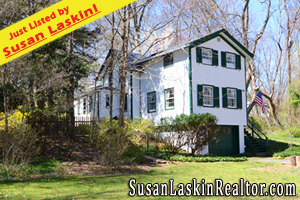 pascack valley nj realtor | Pascack Valley Real Estate - Expert Local Real Estate Information from Susan Laskin, Your Pascack Valley Realtor! Woodcliff Lake NJ Real Estate! Pascack Valley Real Estate! This one is OVER THE TOP. Remarkable & Sophisticated. Total Attention to Detail. Everything is High End. Expansive Center Hall with Amazing Additions and Renovation!! Located on the Prime Hill area of Woodcliff Lake! 3 Sycamore Dr in Woodcliff Lake ($1,298,950!) boasts one of the Most Magnificent Master Suites..Could easily be in a $2.5 MILLION DOLLAR HOME..Private Entrance, Room sized walk in Closet..Custom Cabinetry..Amazing Architectural Details..Gas Fireplace..Balcony overlooking rear yard..Outstanding Vaulted Ceiling Breakfast Room and Great Room Addition off Kitchen with Breakfast Bar..Remarkable Library with High End Custom Cabinetry and wood-burning fireplace..magnificent Baths. Looking for more Woodcliff Lake NJ Real Estate? Browse through my Feature Homes! Some incredible listings across some magnificent Bergen County towns! Custom Colonial in River Vale! Your search has ended! Master Suite with amazing Master Bath! Immense Cathedral Ceiling Great Room Addition w/ walls of windows! 612 Florence Rd in River Vale ($715,950!) is an Updated Custom Colonial that boasts an in-ground heated Sylvan Pool and paver patio. Magnificent Kitchen with custom cabinetry, granite counters and stainless appliances. Butler’s Pantry to Formal Dining Room. Large Living Room. Family Room/fireplace/gas insert. Magnificent details abound. Looking for more River Vale homes for sale? Browse through my Feature Homes! Some incredible listings across the wonderful Pascack Valley towns! Excellent Value in Harrington Park! Located in the wonderful Bergen County town of Harrington Park, New Jersey, 91 Martin Street ($488,950!) is an outstanding Split Level boasting excellent value and a top rated local school district. Set on a quiet street with a wonderful property, this home has 3 bedrooms, 3 beautiful & updated baths and a Spacious Eat in Kitchen w/ large picture window overlooking the spacious, private & inviting rear yard. The large Living Room has hardwood floors and a wood burning fireplace and the Formal Dining Room has sliding glass doors that lead to the newer and inviting composite deck. The ground floor Family Room has a full bath w/ stall shower and leads to the beautiful ground level Sun Room. The finished basement has a home office, exercise room and large walk in closet. Central A/C. Looking for more Harrington Park Real Estate? Browse through my Feature Homes! Some incredible listings across the wonderful Bergen County towns! River Vale NJ Real Estate – Expanded Colonial w/ Exquisite Location! Pascack Valley Real Estate! River Vale NJ Real Estate! Location, Location, Location! Expanded Colonial with hardwood floors on both Levels. Set in the incredible Pascack Valley town of River Vale, New Jersey, 558 Wittich Terrace ($488,950!) boasts an exquisite & remarkable 116 x 191 property (with the ever pivotal “Wow Factor!”). Family Rm/Dining Room expansion w/ cathedral ceiling and a wall of French Doors leading to deck and exquisite rear yard. Main Level is Large Living Rm/Bay Window. Front to Back DR/Family Rm/French doors..Eat in Kitchen,Bedroom, Den and Full Bath..Upper Level has Four Bedrooms (yes..all with hardwood floors)..and a Bath (SS)..Central A/C..Gas heat..Recessed Lighting..Updated Windows..Master BR with Wall of Closets..Laundry Closet Main Level..original owner..Covered Front Porch..2 car garage..AMAZING VALUE! River Vale, New Jersey, known as the Garden Spot of the Pascack Valley, saw the sale of 6 homes during May of 2012. The average List Price was $610,975. The average Sold Price was $554,000. The median Sold Price was $504,500. On average, homes that sold in River Vale during May of 2012 sold for 90.68% of the List Price. In addition, there were 5 River Vale homes Under Contract at the end of May 2012. The average List Price was $597,745. Looking for more information about River Vale & the other wonderful Pascack Valley towns? 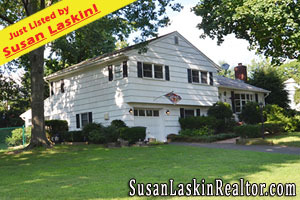 Visit my website, SusanLaskinRealtor.com, where you can Learn about the Pascack Valley Towns, Browse through my Feature Homes, Read through my Library of Real Estate Tips & more! River Vale Real Estate – Antique Colonial! 588 Baylor Avenue in River Vale ($442,950!) is a partially restored & expanded Antique Colonial w/ the ambiance of yesteryear and the loveliness of today! All set on approximately .72 acre of magnificent wooded property, this home boasts a wonderful stenciled Entry Floor, a Large Family Room addition, a beamed original Keeping Room w/ etched beams of past owners and a true formal Dining Room/built in cupboard. There is a large Family Room off Living Room, an updated bath on main level & a spacious Eat in Kitchen. Upper Level has a home office, a Master Suite/Master Bath and 3 additional rooms. The unfinished basement has an entrance from outside. One car attached garage..New Roof..An Exceptional home for the buyer who wants incredible property with gardens, privacy and old world charm..Top rated schools..Easy NYC Commute by car, bus and rail. Pascack Valley Real Estate – Wonderful in Westwood! Westwood NJ Real Estate! Pascack Valley Real Estate! Amazing Value! 124 4th Avenue ($379,950!) 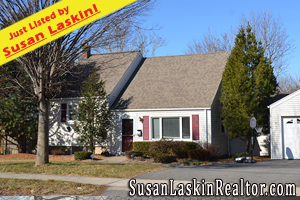 is a lovely & updated 4 Bedroom 2 Bath Split Level set on a lovely property in the wonderful town of Westwood, New Jersey! Large Living Room w/ Recessed lighting & hardwood floors..Updated Eat in Kitchen with beautiful wood cabinetry, stainless appliances and granite counters..Sliding Glass Doors to large deck and flat rear yard..Formal Dining Room.. Four full bedrooms..2 updated baths..Recreation room on lower level..one car attached garage..gas baseboard hot water heat..this home is priced to go..close proximity to beautiful Westwood Town Center, with upscale Shops and Restuarants, and NYC Bus and Rail! Take a Virtual Tour of this home! Click here for more photos & information! Learn more about the wonderful town of Westwood, New Jersey! Visit the Westwood School System! Looking for more Westwood NJ Real Estate? Browse through my Feature Homes! Some incredible listings across the magnificent Pascack Valley towns!